Clinical neuropsychologists frequently evaluate individuals within a forensic context, and therefore must address questions regarding the possible presence of reduced effort, response bias and/or malingering. This volume offers a wide range of instructive real-world case examples involving the complex differential diagnosis where symptom exaggeration and/or malingering cloud the picture. 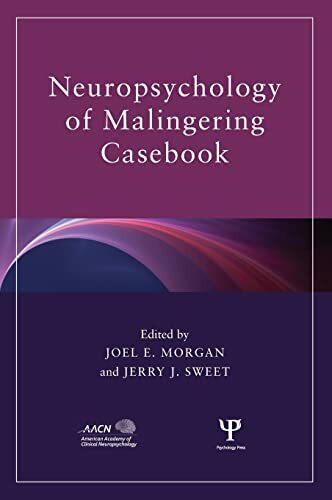 Written by expert forensic neuropsychologists, the scenarios described provide informed, empirically-based and scientifically-derived opinions on the topic. Issues related to malingering, such as response bias and insufficient effort, are discussed thoroughly with regard to a large number of clinical conditions and assessment instruments. Test data and non-test information are considered and integrated by the numerous experts. Expert guidance for clinicians who must address the issue of malingering is provided in a straightforward and well-organized format. To date, there has not been a comparable collection of rich case material relevant to forensic practice in clinical neuropsychology. Joel E. Morgan has been active in professional neuropsychology for over 20 years as teacher, clinician, and journal editor. He is board certified by the American Board of Clinical Neuropsychology of ABPP and currently serves as an oral examiner. Dr. Morgan is active in professional affairs having served on the BOD of the American Academy of Clinical Neuropsychology and Division 40 of APA where he is currently a representative to APA Council. He maintains an active forensic private practice in addition to his editorial, board, and other professional activities. Jerry J. Sweet is Director of the Neuropsychology Service, Head of the Psychology Division, and Vice Chair of the Psychiatry & Behavioral Sciences Department at Evanston Northwestern Healthcare, Evanston, IL. He holds the academic rank of Professor in the Department of Psychiatry and Behavioral Sciences of the Feinberg School of Medicine of Northwestern University, and is board certified in clinical neuropsychology and clinical psychology by the American Board of Professional Psychology. Dr. Sweet edited the textbook Forensic Neuropsychology: Fundamentals and Practice, co-authored the text Psychological Assessment in Medical Settings, and co-edited Handbook of Clinical Psychology in Medical Settings. He has served on numerous journal editorial boards and is currently Co-Editor of The Clinical Neuropsychologist (official journal of the American Academy of Clinical Neuropsychology). Dr. Sweet has published numerous peer-reviewed articles on psychological and neuropsychological assessment, including a large collection of studies relevant to forensic neuropsychology. He has been active in a number of professional societies and is Past President of the American Academy of Clinical Neuropsychology. MORGAN, JOEL E.; SWEET, JERRY J.